Please RSVP if you plan to join us! Unable to attend in person? CEF is inviting members to host house parties (eg. with a potluck) for members in more distant parts of the state to get to know each other and participate in the meeting via video conference (available for anyone with a webcam and internet connection). If you are interested in hosting a house party with other co-op members in your area, please contact General Manager Timothy DenHerder-Thomas. We’ll get you set up for video conferencing and connect you with other members in your area. All members will have the opportunity to vote on Board elections and member resolutions online before the meeting, and we will post information about member house parties and the video conference information well before the meeting. Get to know the co-op! Who are we, why are we, and where have we come from. Learn about the co-op’s progress over the past year including member growth, new solar gardens, and capital secured. Make decisions about term limits for our Board of Directors, hear from Board candidates, and elect new members to the CEF Board of Directors. Samantha Pree-Stinson is a strategist and program manager. She has a degree in Organizational Psychology from Franklin University, a Program Management Certification from UC Berkeley extension, and is a US Army Veteran. She served in Afghanistan as a Combat Medic SGT. Samantha ran for office in the Minneapolis City Council race in 2017 followed by being appointed the Senior Policy Advisor for Councilmember Phillipe Cunningham in the 4th Ward of Minneapolis. She has been an educator and Associate Director of Education at Corinthian Colleges and worked at Medtronic as a Compliance Auditor in the Neuromodulation Division and as a leader of both the Global Women’s Network and African Descent Network Twin Cities. Samantha previously served on the executive board at both MTN and KMOJ. She is currently an appointed at large member of the MET Council Equity Advisory Committee. Samantha is also the newly elected Co-Chair of the MN Green Party. She is currently the lead of Organizational Alignment for Village Financial Cooperative. She is a mother of 3 sons and has been married for 20 years. Samantha’s passion is helping others to realize their full potential, grassroots small D democracy building, and creating local cooperative and sustainable solutions to meet the needs of the community. Run for the CEF Board of Directors! We want to make especially sure that Board members from greater Minnesota can also participate, so we will be ensuring that monthly Board meetings are accessible via video conference. If you can’t commit to coming to the Twin Cities in person each month, but could sign on for a monthly meeting online, please don’t hesitate to run for the Board! The Board elections will be open for voting online before the Annual member meeting and will conclude with final voting during the Annual Meeting itself. To make this possible, we’re asking that everyone who wants to run submit their nomination by Sunday April 28th so we can send out candidate statements and ballots ahead of time. Please consider running! For more information about what it means to be a Board Member, and to submit your nomination, please submit a nomination form before 4/21/2019. Members participating in the meeting by conference call will be able to vote in the Board election online. All members should receive an invitation to vote via online form on Tuesday 4/24 and may vote during the Board election period between 7:15PM and 8PM on Thursday 4/26. We ask that members review the CEF 2018 Board Candidate Statements and listen in as the candidates pitch their candidacy at the annual meeting. If you are a member, wish to vote online, and have not received an online ballot, please feel free to contact General Manager Timothy DenHerder-Thomas to request one. 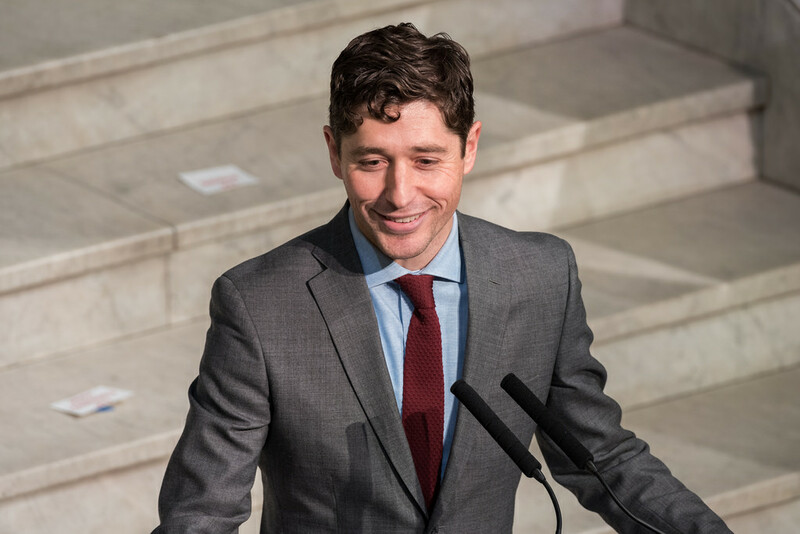 CEF is excited to invite Minneapolis Mayor Jacob Frey as our 2018 Annual Meeting Keynote speaker. Recently elected in November 2017, Mayor Frey has already voiced his support for CEF’s vision at the Shiloh Temple launch event March 9 and has called for Minneapolis to lead the way on climate action through the Minneapolis Clean Energy Partnership. Mayor Frey will discuss how groups like CEF help advance city’s climate and economic justice goals and how grassroots efforts like ours can best leverage the power of local governments to secure a better energy future. Nominations for the CEF Board of Directors closed on Sunday 4/22, and Board candidate statements are now available for review. If you are a member and voting in elections, please review the CEF 2018 Board Candidate Statements. Thanks to our sponsors for helping make this event possible! Cooperative Energy Futures is a co-op – that means we’re member-owned and democratically controlled. CEF is managed by a 9-member Board of Directors who are co-op members elected by members of the co-op as a whole. Once a year, CEF members get to elect – and run for – the Board. Its time for the 2017 CEF Board elections! The actual elections will take place at the CEF Annual Member Meeting on April 20th. CEF members are invited to self- nominate to run for the CEF Board of Directors. The CEF Board meets monthly to guide the co-ops directions and make key business decisions on behalf of the members. CEF Board members are elected for 2-year terms at our Annual Members meeting, which this year is coming up on Thursday April 20th, 2017. Any member can run for the Board, and this year, we have seven open Board seats, so its a great time to get more involved as a CEF Board member. Learn more about what it means to be a Board member and submit your nomination here. Cooperative Energy Futures, in partnership with the City of Edina and Minnesota Interfaith Power and Light has filled the Edina Community Solar Garden with residential subscribers. The solar garden will enable 66 Edina families to offset their energy bills with credits from their share of the solar garden, which will be built on the roof of the Edina Public Works building in Spring 2017. The Edina solar garden will likely be the largest urban rooftop solar garden in Minnesota at the time that it is built and will serve as a role model for how local cities can use the large vacant roof spaces they control to host clean energy projects that benefit residents of their city. By hosting the solar garden and subscribing, the city of Edina and subscribers lead the way towards climate solutions that grow local jobs, clean energy, and community wealth. Read more news about the Edina Community Solar Garden in Edina Magazine and the Edina Sun Current. Subscribers to the Edina solar garden will pay Cooperative Energy Futures each month for the solar energy produced by their portion of the array: if you subscribed for 2% of the garden capacity, you pay for 2% of its production each month. At the same time, Xcel Energy will credit each subscriber on their Xcel Energy bill for that same amount of production. Subscription rates are set so that each month, the subscriber comes out ahead while locking in their energy cost over the long term. The solar garden also contributes to Xcel Energy’s statewide requirements to provide over 30% of total energy from renewable sources by 2020. As members of Cooperative Energy Futures, subscribers are member-owners of a cooperative providing clean renewable energy to the grid. Help us launch a new Community Solar Garden that you would be eligible for by recommending and connecting us with a potential host site. If you know a potential location interested in serving as a host site of a community solar array, you can send a recommendation to Solar Site Assessor Bruce Konewko at bruce@cooperativeenergyfutures.com, (612) 568-2334. Please include your name, contact information, the specific address (street, city, state, zip) of the site you are recommending, and a sentence or two about your connection to the site and its owner. Good solar garden sites are at least 30,000 square feet of empty space on a flat roof, or 1-5 acres of parking lots (for a solar canopy system) or open land. Large public buildings like schools and public works buildings, some large congregations, and large commercial or warehouse spaces make great roofs, as do open parking lots or fields. Value-of-solar (VOS) rate adopted for all applications starting 1/1/2017. While we don’t yet know the 2017 VOS, the 2016 VOS was $0.0995/kWh, as compared to $0.1174/kWh for commercial and $0.146/kWh for residential under the ARR. So by itself, this is likely to decrease value for residential and low-income CSGs substantially (bad for CEF members). Xcel must use weather-normalized historic peak load capacity when calculating VOS (likely a good thing for CEF members). Starting with the 2018 VOS, Xcel must use a location-specific calculation of avoided costs of distribution capacity. This will likely incentivize load-connected and urban CSGs that avoid more costs, and will likely result in a higher VOS for those projects (this starts to accurately value the added efficiency of truly distributed (load-connected) energy. However, this won’t come into effect until 2018 garden applications. A garden application that is deemed complete in a given year will be applicable for the VOS of that given year (regardless of whether it was applied for or completed in a different year). This provides very valuable clarity that is helpful to CEF and other solar garden developers. Xcel must file their VOS calculation for the following year by Oct 1 of a given year (the clarity is also helpful, the timeline could be better and could be worse). PUC did nothing on almost all recommendations either positive or negative. They did require Xcel to propose a low-income CSG program for LIHEAP-qualifying subscribers by March 1. Non-Xcel entities may also submit proposals for consideration, though it is not clear in what form or timeline these will be welcome. Co-location will remain at 1MW. This will hurt big out of state developers and should be fine for smaller community-based developers. The $1 million material upgrade limit (the max a developer is allowed to pay for transmission upgrades) has been removed. This has little impact given the 1MW max because no developer will pay $1million for interconnection upgrades for 1MW anyway. There are a number of minor changes to the delays and timeframes allowed to developers to complete the projects. These are generally good and reasonable. On low-income provisions, not much good happened, but nothing bad happened (except the rate issues below). The process in 2016 did lay a foundation for future improvements in 2017 and beyond, so while we hoped for clearer and more ambitious improvements, we are making progress. The big deal here is the rates. The current value and calculation method for Value of Solar is bad for residential subscribers and low-income people, and creates a major hit to the program starting Jan 1. However, if the Department of Commerce proposes (and the PUC approves) meaningful adders to VOS for residential and low-income (and possibly other feature) it could end up being a very good thing for CEF and other developers seeking to serve residents and low-income families. There are also other predictability elements of VOS and the shift to locational avoided costs that are in the long-run a strong improvement to the financability of CSGs. The big question for low-income and residential subscribers is what the adders will be and how long it will take the PUC to review and approve them. CEF is exploring how best to contribute to this process. The CSG environment in MN will steadily be shifting towards small and mid-scale local and community developers and away from dominance by large out of state developers. Xcel has to propose a way to serve low-income people and others can develop alternative proposals to the PUC if they wish. CEF is exploring how best to contribute to this process.